Well... I'm playing aurora for quite some time now, just started a new game on 6.20. I actually never had the... erm... luck? yeah, let's say luck... of encountering any of everyone's favorite space beetles : the star swarm. Due to some serious tanker issues (no jump-capable model yet... shame on me. ), operations are mostly limited to the closest systems. One of the Gravsurvey ship on solo operation in Ross 47 had the bad surprise of finding suddenly twenty very-very-typical 800t meson-ships on top of it... a Judas/LRS scout sent there for investigation following the lack of report of the gravsurvey ship was also ambushed, but its sister ship managed to stay away and, thanks to its standoff sensor drones, identify the main base of operation of our happy tree meson friends. "Geoula"-class : 5650t ship. 5 spotted. "Romat"-class : 800t ship. 20 spotted. Note : sensor buoy was destroyed 10 seconds after its first report. Immediately, Sol industries switched to war mode. The shipyard workers were working overtime while 75% of construction factories pre-built ship components, reducing dramatically the time needed for assembling brand new ships. In less than one year, the military fleet was expanded from the old "quatuor in UV minor" to the destructive equivalent of a philarmonic orchestra. - 1 "Judas/FS" class Fleet Scout frigate. This is the main sensor array for the fleet. Its resolution 20 scanner was designed with the range of the Pluton missiles in mind while the resolution 1 scanner will provide ample warning on any kind of threats, allowing medium range strikes by the protectors. As this ship is a vital tactical asset in most operations, it was designed as being heavily armored and a teeny bit faster than the rest of the warships in order to being able to split and run out of range of eventual threats. This design is classed as a military vessel for maintenance purposesThose missile defense frigates are designed as being able to track and destroy up to three different targets at once. They also includes a backup active scanner, but with a puny range compared to the ASR/PD 16-8-8 of the Judas/FS. Mission purpose : Flyswatters main damage dealers for those very quick 800t gunboats. - 12 "Thor" class Beam Defence Frigates. The GB-1/M does not boast a backup sensor like the frigates. The doctrine for use of those missile boats was to use the Occulus to actively scan the enemy ships. Due to the presence of the Judas/FS, they are actually supposed to be useless for this operation - as the GB-1/Ms should fire a single volley at max range. - 30 GB-1/M "Pounder" class missile boats. The internal sensors of the two variants of pluton missiles (active and thermal) are supposed to allow retargetting in case of overkill on a single target. - Their missile fire control have a too large resolution (20) to cope with the gunships at max range. Should not be that big of an issue. - The thermal sensors of the Pluton-T missiles will also be unlikely to track the gunboats. They might be able to finish off a few badly damaged ones however. Mission purpose : Alpha strike on the ennemy gunships. -1 "Judas/LRS mod B" class Long Range Scout frigate. This design is classed as a military vessel for maintenance purposesA variant of the Judas/FS, buildable in the same yard. The active sensors and shields are replaced by a large thermal sensor, a jumpdrive, additional fuel tanks and four reduced size 4 launchers fitted with recon missiles/buoys, allowing this variant standalone operation in potentially hostile systems. A simple military jump tender, destroyer sized (8000 tons). Commercial design for convenience. 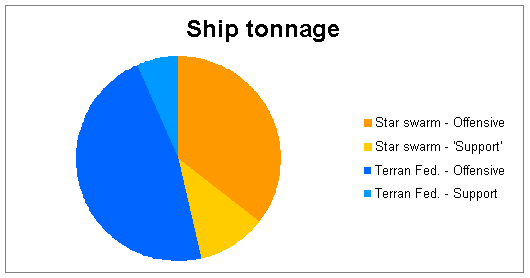 Also includes some extra fuel tanks, but barely enough for that many fuel-hungry ships. The task force arrive at last in the Ross 47 system. Task force commander Christopher Payne notes that, despite refuelling at the sol-sirius gate, only 60% of the fuel is remaining. The always delayed retooling of the Serguei Korolev Commercial Yard for building the forever promised "Zoroaster" Jump Tug/Tankers feels painful, and may feel even more painful if the task force runs out of fuel during the return trip. Commander Payne decide to petition once more for the building of smaller 8000t tankers compatible with the destroyer-sized jump tenders. The Judas/LRS launch a single LESD-2 (Long Endurance Sensor Drone) toward the last known position of the ennemy fleet : the ninth moon of the supergiant Ross 47 IV. 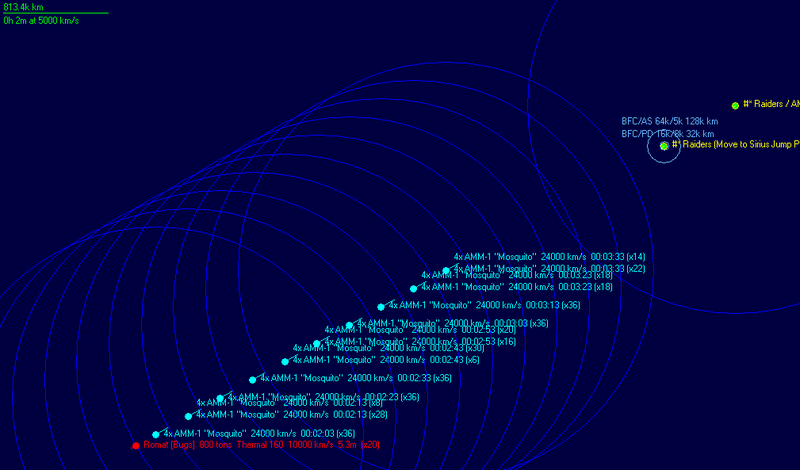 The main fleet starts to advance toward the gas giant, at a reduced 3000 km/s speed. Not only for reducing the thermal signature of the fleet and preventing an early interception but also (and mainly) for... not overtaking the painfully slow LESD. Those drones boast an impressive 20b km range, but also a ridiculous 2900 km/s speed. However, this combination was considered as adequate for their purpose : active scan, passive scan and geosurvey of distant bodies without risking a ship. 14th - 18th of january. 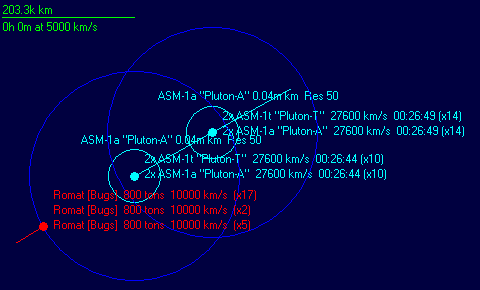 The fleet reduces again its speed to 2000 km/s, then 1000 km/s, hoping being detected as late as possible. The LESD-2 *finally* arrive and release its second stage : a size 1 multipurpose scanning buoy. The results are worrying : only the 5 Geoulas remains in orbit of the planet. 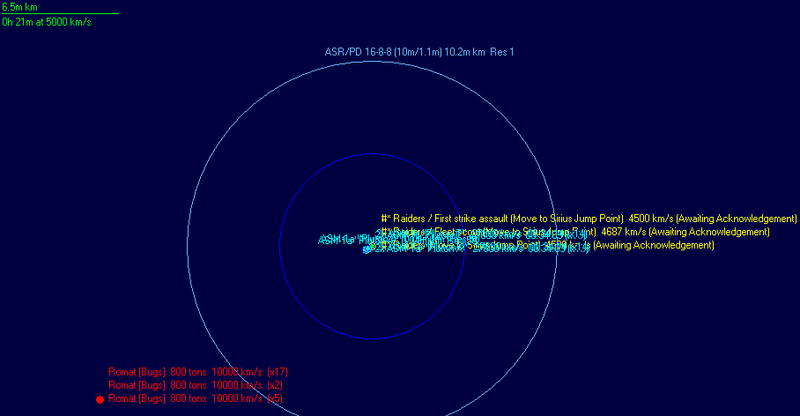 Commander Payne decide to immediately turning on the active sensors of the Judas/FS, still 280m km away from the moon, hoping to at least lure the other ships. The speed of the fleet is also set to the maximum 4500 km/s. Alarms starts to ring in the Judas/FS, then in all other ships of the task force : All the 20 known Romats and 4 new ones are sighted less than 17m km away. This unexpected turn of events is met with professionalism by the crews, as the distance is still significant enough for not being an immediate threat. All ships are immediately ordered to go back toward the jump point, and the Judas/FS is detached of the fleet in accordance with the plan. 24 of the Pounders are also ordered to shoot at the Romats. Pounder-005 -nicknamed "The bucket"- and 016 -nicknamed "Nancy" in honor of the often-lightly-dressed personal assistant of Grand Admiral Christian Brongniart- have the honor of firing the very first salvoes, quickly followed by eight other salvo. 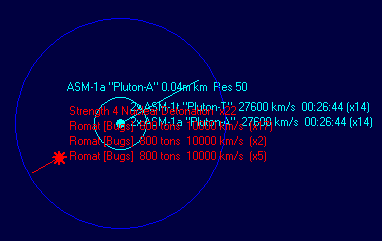 Ten seconds later, almost one hundred Pluton-A and T are flying toward the Romats. With a relative speed of 37600 km/s for covering the 16.8m km, the missiles are supposed to impact in less than eight minutes... IF they manage to hit those quick targets. The tension is almost palpable in the ships. Most of the bridge crew are watching the large tactical screens displaying the current situation instead of tending to their allocated subsystems. "First impact in 5... 4... 3... 2... 1... Impact! Second impact... Now!" On the tactical screen, all missiles are replaced by the nuclear detonation symbol. A massive secondary explosion more than three megatons was also reported, leading to some unhealthy grins among the crew. "Hit report : First wave, 40 missiles, 22 hits. Second wave, 56 missiles, 33 hits. Two additional hits from retargetted missiles. 59.3% hit rate. No sign of point defence." As the explosion began to fade on the screen, the smiles of the bridge crew began to fade as well. Of the 24 targets, only one was vaporized by the lucky (not that lucky for the relevant ship) secondary explosion. Two other ships were sitting ducks, and had been the targets of the 2 retargetted missiles. 21 of those fearsome meson-toting were still inbound at their full speed. "Captain, no atmosphere venting detected, but sensors detects a signature typical of fluids streaming from 9 of those ships..."
"Send the IDs of 6 of the non-venting ships to the remaining Pounders." Nice writeup. Your missile boats are doing well. But you are lucky, that you did not met 50 or more swarm FACs. I'm eagerly waiting for the second part. A short 10-minutes briefing is held between Commander Payne and the captains of the twelve protectors. The protectors should lock one Romat each as soon as they can, then fire a single salvo as soon as the ennemy break the 8m km mark. Furthermore, 8 of the protectors are also ordered to use their secondary fire control to lock the remaining gunships and shot a second salvo toward those ones. but commander Payne rejected this idea in order to conserve ammo and gather more intelligence on the sturdiness of those ships. The quite persistent Romats are in range of the fire controls of the protectors. All of them were immediately locked by the protectors' fire controls. The order echos through the hulls of the Protectors frigate, triggering a frenzy of activity in them. thirty seconds later, 144 mosquitoes are launched, and half of the protectors swiches to their second fire control for the next volley. 10 seconds later, 84 additionnal missiles are inbound. Tactical screens are once again filled with explosions. Two hundred missiles usually have this kind of messy effects. "Hit report : First wave, 144 missiles, 94 hits. Second wave, 84 missiles, 52 hits. 64% hit rate. Several secondary explosion detected." "4 targets destroyed, 5 immobilized, 10 still inbound." Even Commander Payne smiled, as this justified his earlier conservative decision. "Stop all ships. Set course toward the moon again. Order ten of the protectors to shot a volley at the remaining gunships." one minute later, 120 mosquitoes are launched, hopefully dooming the remaining gunships. After 68 impacts, 2 more are destroyed while 3 float motionlessly in space. New orders are sent to fire 24 missiles per target in order to quickly finish them off. 120 mosquitoes inbound, tally-ho! The mosquitoes proved more than adequate, as 4 gunship were reduced to irradiated debris and the remaining one is barely mobile. 3 of the salvoes, 36 missiles total, were also reported as self-destructing due to lack of targets. A new briefing is held, this time directed to the captains of the Thors. They are ordered to lock and shot at the remaining disabled gunship when the fleet pass them - no need to waste missiles on those cripples. Bets are made on which one of the Thors will have the best kill count, most wagers are on the 007 and the 009, commanded by the most reactive instructors of the fleet. Sorry for the lack of details, but I had a power outage and lost all the pictures and most of the text. One of the crippled "gunship" is in firing range... and also in optics range. The first visual contact with those "ships" revealed the cold and hard truth, and explained both the "fluid venting" and the lack of a distinct wreck : Those are not ships, but space capable insectoid life forms. The twelve turrets opened fire, the exosqueleton of the "bug" melted in several areas, and soon enough the lifeless husk drops out of the sensors. A bug returns fire before succumbing to the hail of ultraviolet beams. The 6 dead following the explosion of the active sensor in the unlucky targetted Occulus are the first reported casualties of the battle. Commander Payne urges his men to stay alert and careful against such unforgiving weapons. The last of the wounded bug is dealt with. With no immediate threat in the horizon, the current shift is allowed some rest while the fleet continue its progress. 18th of January, 10:00:00. Thor-001 mess hall. "So... What do you think of those... bugs...", starts commander Payne while slurping a cup of coffee. Dr Manfred Rorsh glanced uneasily at commander Payne. - What about the samples we retrieved, as you suggested? - Those samples may prove insightful once delivered to a fully equiped BSL-5 lab, and the only one of those is still being qualified on Phobos. However... Those insectoids are a very interesting example of adaptation to space condition. I can not even figure how they move in hard vacuum, nor what their life cycle may be, but I am able to extrapolate some data according to their behavior. There is roughly two class of insects back on earth. Most are composed of similar polyvalent individuals, with sometime some sexual dismorphism. All members of those species are able to hunt and breed by themselves. However, social insects like ants, bees or termites, are specialized on a given task. As three very different kind of those insectoids have been sighted, we can consider that they follow the same model. The Romats we encountered are soldier drones, designed to protect some kind of "hive". They seems to lack basic survival instinct, as they just went on attacking despite tremendous losses. This is in accordance with the behavior of soldier ants on earth. The Geoula still in orbit of the moon are probably unarmed worker drones, explaining why they did not came to intercept us. The fact that those insects are focused on this moon probably means that their hive is located there. The huge Eliat is most probably the equivalent of an ant queen but, unlike those, seems to be more mobile and armed according to previous reports. - So... you mean the Eliat may lay more of those soldiers? Or those insects may be something completely different from what we're used to see. - Well, thank you doctor, it was enlightening. SensOff Xiong Tian Liang was starting the 4th hour of his shift. bleep. Still two to go, and nothing interesting happened. bleep. His mind was wandering for quite some time now, thinking of his familly back in Canton. bleep. The smile of Son when he received his awaited "Thor-replica-with-working-turret" last christmas. bleep. The sad and worried smile of Lan, his wife, when he had to tell her that his ship was scheduled for an "armed recon" mission. bleep. "Contact confirmed. 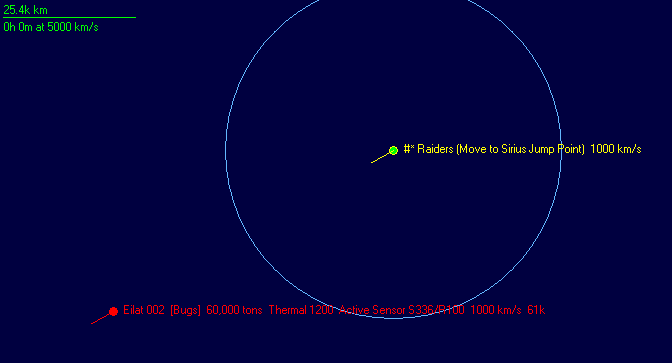 60 000 ton ship, 56.6m km away, right ahead." "Signature analysed and confirmed as being the already known Eilat 002. Heading straight for the fleet at 1000 km/s." "The target is now 40mkm away. It will be in range of our Thors in about two hours. As we obviously have a speed advantage, we can use this agelong military tactic called 'kiting'. The fleet will carry on closing on the target until it is about 1mkm. The course then will be changed back toward the jump point, at minimal speed. We will let the target close inside the range of our thors - around 100 000 km, then match its speed. The thor will just have to shot at it until it fall apart. Even easier than shoting martian pandas. Any question?" Once again, Captain Citron starts speaking. "Commander, If I may? Thank you... Well... As this is the first contact with this kind of ennemy, perhaps we should start softening it a bit with our mosquitoes? Furthermore, this thing may have some close range point defenses that we don't knows of, and it will allows to check these before risking any of our ships"
After pondering a bit, Commander Payne agreed this time : "Indeed, indeed... All Protectors will shot a single volley at 7.5 mkm. The rest of the plan is unchanged for now - we may revise it after analysing the result of the impact. Any other issue to raise?" With no further question, the briefing is then ajourned. "Erm... Commander? You might want to see that..."
"What is it? The EM signatures of the Eilat?" "Yes, it is... according to computer estimations, those EM signatures are active sensor signature and shield signatures... and... well... they're quite large..."
"A 300 mkm-range active sensor... no wonder those pesky soldiers were sent to intercept us that quickly. They probably detected us as soon as we jumped in the system. And those shields... How can a living organism can even generate a protection field! Well, this is interesting, but it only means that we'll have to let our lasers hot longer than expected. Nothing more. Unless..."
"Nevermind... Thanks for the data, and stay alert, lieutenant. Dismiss." ... Unless this thing lay a second wave of soldiers in front of us, Payne thought. "Commander? All Protectors are reporting being scrambled and unable to shot. The range of their fire control is reduced by an estimated 30%, at 6.72 mkm." "Electronic warfare? from a bug? this is getting utterly insane... Order the protectors to fire as soon as they can, then turn back toward the jump point at 1 km/s. Order them to keep a minimal 1 mkm distance with the target." Being finally in range, the Protectors shot their volley, then change course toward the waypoint. "ComOff. Order the Thor group to halt and set course toward the jump point. Minimal speed." "First impact in 5... 4... 3... 2... 1... Impact! 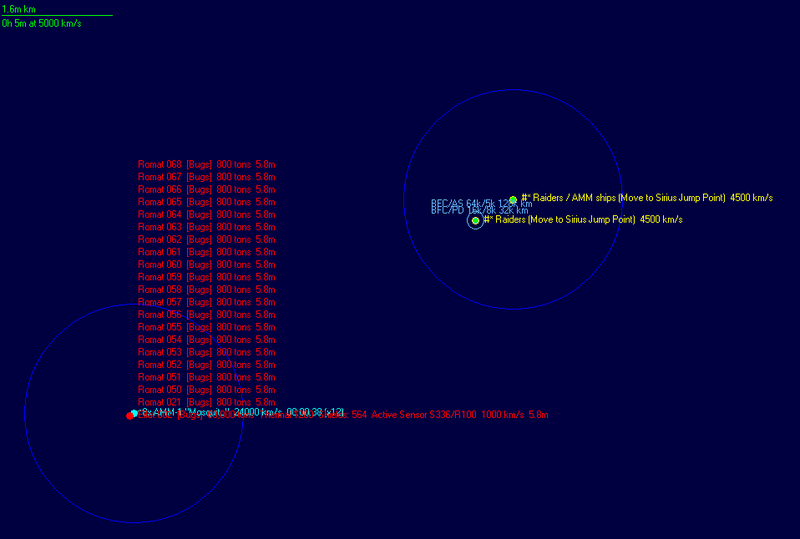 3 salvoes destroyed by point defense fire, all other missiles on target - 36 detonations detected. Wait, that's not r... MULTIPLE CONTACTS! 20 new romats, right next to the Eilat!" "ALL SHIPS! FULL SPEED AHEAD! Protectors are to fire at the Romats - 8 tubes per targets, and they should not stop nuking them 'till they glow!" Yes, unexpected turn of event. So how many missiles do you have in your magazines? I wonder why the Eliat sent only 20 romats after your ships and not 40? Maybe the queen has another 20 in her belly. Fortunately, the magazine of the Protectors is quite deep - they usually carry 252 AMMs. There's no 001. Enemy ships always begin with 002. However, Tactical analysis will later revel that 3 of the 8-missiles strong volley were anhihilated by the point blank defenses of the Eilat. The twelve Protectors start launching missiles, 36 salvoes of 4 missiles each are going straight at the romats. "Sir? Protectors reports that 1440 missiles are inbound and ammo is getting low..."
Reports show that 2/3rd of the stockpile of mosquitoes are spent. Six to seven volleys are remaining. With the first waves of missiles closing on the unexpected guests, the tension is once again as an all time high. This time, there's none of the powerful Pluton missiles, but only some missiles that were not designed as ship killers. The first wave impact with some damage as one of the soldier, hit by seven of the eight missiles, is already "bleeding"
The fourth volley proves decisive, with several secondary explosions wreaking havoc on the remaining Romats. Only eight of them are still able to continue their progression. Orders are sent to send to send a single volley at them, six ship per target. Additional orders are sent to ADF Aspis and Yetholm to shot a second volley at the Eilat "just in case this box have other jacks inside", unfortunately the hive ship is now out of range of the fire controls of the frigates. Meanwhile, the crippled ships are all reduced to debris by the later waves of missiles, leaving only this dirty pair to take care of. The two survivors did not survive any longer when those 120 missiles reached them and blasted them out of this corner of the galaxy. 24 missiles are launched at the Eilat. Less than five minutes later, the missiles reach the Eilat. Only 5 of the 24 missiles actually survives the hail of point defense fire. The speed of the Thor battlegroup is set to a minimum again. Only to notice that ECMs works in many way. Despite the size of the behemoth, the laser turrets fire control can not track the Eilat. At 90000 km, a lucky shot manage to hit the Eilat, but one shot won't be enough. At 70000 km, the hit chance seems to be a ridiculous 20%. After several minutes with no obvious progress, a drastic decision to close the range to 61000 km is taken. The damage is still a measly one per hit, but the hit ratio is now an almost impressive 25%. The Eilat is following the battlegroup for quite some time, its shields slowly depleted by the lasers. One of the bridge crew of Thor-005 starts whistling the now classical tune Yakety Sax. He is immediately reprimanded by his captain and scheduled for "turret oiling duty". After nine minutes of almost constant laser fire, the shields of the Eilat are down to 300, half of their original strength. All the Thors are focusing their fire on the Eilat when, suddenly... The mess staff brings a round of hot coffee for the bored bridge crew. Guess what? If you said 'Yawn', You won! At last, the monstrosity is showing signs of weakening. A trail of fluid is spotted on its port side, right next to a pseudopod. After more than half an hour of boring repetitive one-sided shooting, the bleeding of the Eilat is now consistent. Now every volley lead to new leaks. One of the laser hits a weird antenna, turning it to ashes. Seems like it was a vital part of the biological ECM of the Eilat, as the fire controls of the Thors are now working as intended. In the later minutes, the fact that some explosions are sighted, as well as the reduction of thermal and EM signatures, are a giveaway : one by one, the various organs of the strange beast are failing under the volume of the now accurate laser fire. On Judas/FS, SensOff Xiong Tian Liang mutters "Ni yi jing su le" before sipping some tea, hoping for his unexpectedly long shift to end. The tiredness of the various crew is starting to show, and in a ruthless way. Some mistake were made when recomputing the required speed to stay at the same distance of the target. Thor-6 was immediately hit by several meson beams, piercing a rack of fuel tanks, destroying two shield generator and hitting the turret - fortunately with no significant damage. Emergency devices immediately set the fleet to full speed again. No casualties are reported. Twenty seconds later, the dead Eilat falls off the sensors. And the fuel shortage leading to the stranding of the fleet in the Sirius system is too shameful to add on the report... Wait, did I wrote it? Doh! So...I think it was a very smooth operation, especially for a ion-tech level fleet. The advantage in ship tonnage may have played a bit. The alpha strike from the missile boat was actually not really significant - The bugswatters worked wonderfully by themselves. the laser wielding Thors proved a bit lacking however. Trying to compromise by using 12cm lasers was not a good idea - the next version of the Thor will have a quad 10cm laser, far enough for AM duty, allowing the housing of a single hull-mounted 15cm for some real (for this tech level) punch. The reactor should be able to provide for both at the same time, so the 10cm might be used offensively if no counterfire is expected. ECM is annoying for missile ships, but is really crippling for beamships. ECCM research is planned ASAP. Jump-capable tankers are ALSO planned ASAP. the new fuel model is very demanding. And those ships does not use ludicrously overboosted engines (x1.5 for the MS3, x1.25 for the MSes3). Nice reading. Yes you have to be careful when you want to attack the queen with beam ships. Once i gave the order to close the distance to get better accuracy and I accidentally hit the 5min increment instead of 5sec. You can imagine the results.